63 w w w . M o d e r n T i r e D e a l e r . c o m ©20 1 8 C M A , L LC . We are on a mission to deliver excellence in every aspect of our business. 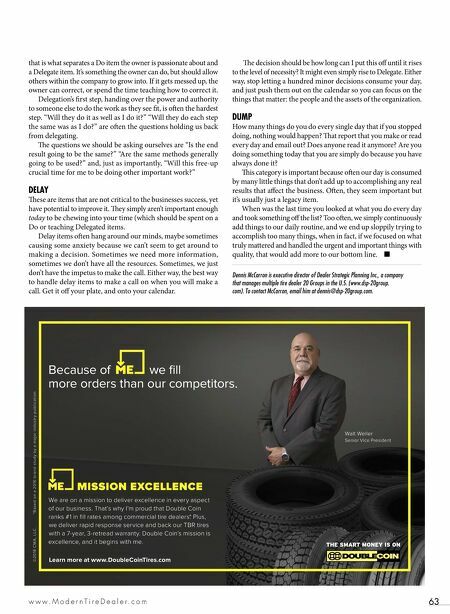 That's why I'm proud that Double Coin ranks #1 in fill rates among commercial tire dealers. * Plus, we deliver rapid response service and back our TBR tires with a 7-year, 3-retread warranty. Double Coin's mission is excellence, and it begins with me. Learn more at www.DoubleCoinTires.com Walt Weller Senior Vice President Because of we fill more orders than our competitors. MISSION EXCELLENCE * B a s e d o n a 20 1 6 b r a n d s t u d y b y a m a j o r i n d u s t r y p u b l i c a t i o n that is what separates a Do item the owner is passionate about and a Delegate item. It's something the owner can do, but should allow others within the company to grow into. If it gets messed up, the owner can correct, or spend the time teaching how to correct it. Delegation's first step, handing over the power and authority to someone else to do the work as they see fit, is oen the hardest step. "Will they do it as well as I do it?" "Will they do each step the same was as I do?" 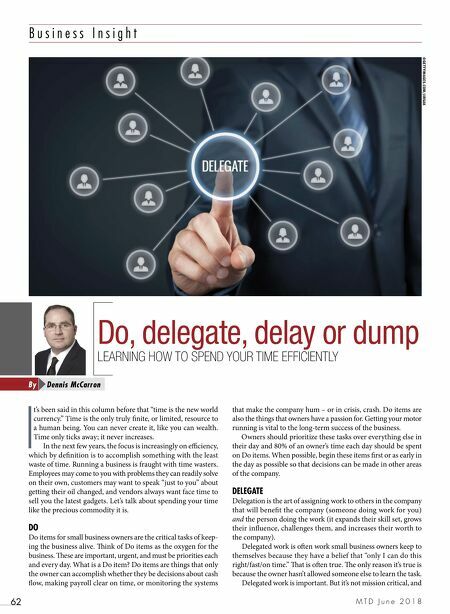 are oen the questions holding us back from delegating. e questions we should be asking ourselves are "Is the end result going to be the same?" "Are the same methods generally going to be used?" and, just as importantly, "Will this free-up crucial time for me to be doing other important work?" DELAY ese are items that are not critical to the businesses success, yet have potential to improve it. ey simply aren't important enough today to be chewing into your time (which should be spent on a Do or teaching Delegated items. Delay items oen hang around our minds, maybe sometimes causing some anxiety because we can't seem to get around to making a decision. Sometimes we need more information, sometimes we don't have all the resources. Sometimes, we just don't have the impetus to make the call. Either way, the best way to handle delay items to make a call on when you will make a call. Get it off your plate, and onto your calendar. e decision should be how long can I put this off until it rises to the level of necessity? It might even simply rise to Delegate. Either way, stop letting a hundred minor decisions consume your day, and just push them out on the calendar so you can focus on the things that matter: the people and the assets of the organization. DUMP How many things do you do every single day that if you stopped doing, nothing would happen? at report that you make or read every day and email out? Does anyone read it anymore? Are you doing something today that you are simply do because you have always done it? is category is important because oen our day is consumed by many little things that don't add up to accomplishing any real results that affect the business. Oen, they seem important but it's usually just a legacy item. When was the last time you looked at what you do every day and took something off the list? Too oen, we simply continuously add things to our daily routine, and we end up sloppily trying to accomplish too many things, when in fact, if we focused on what truly mattered and handled the urgent and important things with quality, that would add more to our bottom line. ■ Dennis McCarron is executive director of Dealer Strategic Planning Inc., a company that manages multiple tire dealer 20 Groups in the U.S. (www.dsp-20group. com). To contact McCarron, email him at dennis@dsp-20group.com.